Do you remember the 1990s? I do. It was a time of radical change; the Soviet Union "fell/was dissolved" in 1991, the internet gained widespread popularity as the decade progressed, and less seriously, popular music changed from the saccharine party anthems of the 1980s (hi Def Leppard!) to more angst-fuelled anthems of disillusionment and alienation (hi Seattle!). Some dismissed the gritty dirges of Pearl Jam, Soundgarden and Nirvana, yet at the heart of grunge was some damned fine songwriting. The 1990s also saw MTV launch its Unplugged series; a forum where musicians could showcase their songs in a stripped-down format. There were some odd performances (Korn anyone?) but many were terrific. Seattle grunge groups like Nirvana and Alice In Chains proved that their songs worked even when stipped of the noisy guitars and screaming vocals. Eric Clapton's contribution, however, remains my favourite Unplugged album. 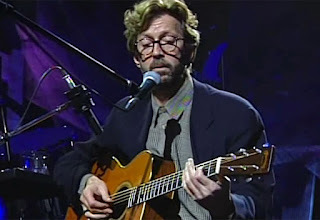 Clapton had long established his position as one of the most influential guitarists in rock history, and Unplugged showed his mastery of blues guitar playing wasn't limited to the iconic Fender Stratocaster. Some things work beautifully, regardless of context. 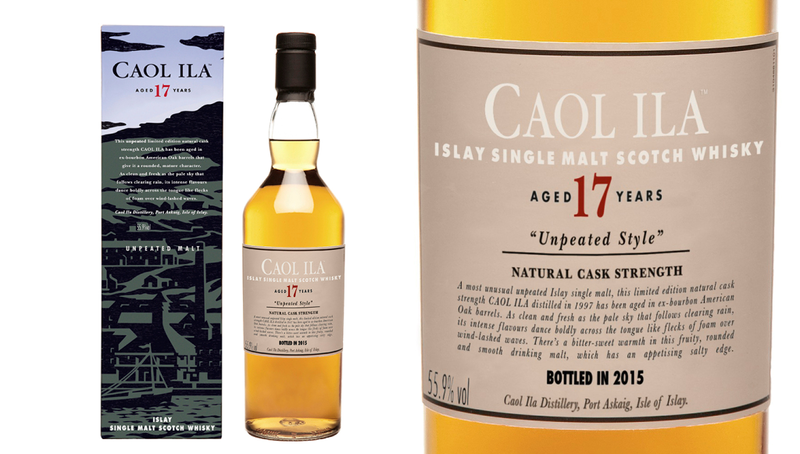 Clapton's Unplugged is one example, Caol Ila 17 Year Old Unpeated Cask Strength Single Malt is another. Un-what now? 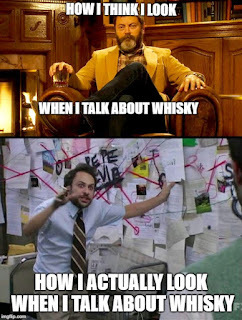 Or "What is peated whisky?" When making malt whisky, the barley must be malted, aka sprouted or germinated. Traditionally, the barley is steeped in water and left for germination on malting floors. Unless the distillery has outsourced the process to a larger, more automated "maltsters", the barley must be turned over by hand in carefully timed intervals so that all grains germinate equally. Germination takes about five days. After the barley grain has opened and the germ has reached approximately 2/3 of the length of the grain, the starch has turned into sugar. Now the germination process is interrupted by spreading the still wet barley on grids in the kiln and drying it with hot air from below. This stage contributes significantly to the character of the whisky. 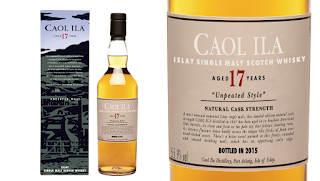 If you add peat to the fire, the malt gets a smoky peat note.¹ Caol Ila traditionally peats their malted barley to a phenol level of about 35 ppm (parts per million), but this 2015 Special Release from Diageo (the ownership group that Caol Ila belongs to) uses unpeated barley malt. So how does this whisky taste when the smoke and peat are removed? This review is from a single sample provided by a friend. The whisky is bottled at 55.9% ABV. It was opened September 20, 2016, and gassed (with Private Preserve) after each use. It was decanted to a smaller bottle April 25, 2017, gassed after each use, and the sample was poured November 5, 2017, with the decanted bottle being 2/3 full. Nose (undiluted): this may be unpeated, but there is still an unmistakable vegetal note present. It isn’t smoky, but there’s a mossy note, damp leaves perhaps. It's also surprisingly fruity. Ripe pears. Charred lemons. Kraft Caramels (the little, individually-wrapped ones). A bit of iodine. A touch of black pepper. Briny as it opens up. Complex and expressive. Palate (undiluted): opens on a mineral note, almost chalky at first, wet slate maybe. It’s quickly replaced by a pleasant fruitiness; ripe pears and toffee with a black pepper kick near the end, yet it doesn't feel hot for a whisky that's bottled at 55.8% ABV. With time, there's a pleasant waxy feel to the body of the whisky. It's very enjoyable, especially combined with the green apple on the finish. Finish: fairly long, more toffee, some brine returning and a very prominent green apple note (sweet, not sour) developing at the very end of the finish. That last note took me by surprise but it’s unmistakable. With water, the maritime brine comes forward on the nose immediately. But it’s still not smoky. Which makes sense; it IS unpeated, after all. There’s also more black pepper and oak spice with water added. The taste is sweeter, but less fruity with water. Green apples and lots of caramel. There's also a strong cereal note (oatmeal?) coming through with the addition of water. The finish doesn’t change much with water. That green apple hangs around forever. And it’s very enjoyable. I would never have guessed this was over 48% ABV. Very approachable and “friendly”.